Dr. Heather Evans has been surrounded by animals from the very start. Born into a rural home in the California foothills with horses, beef cattle, dogs, cats and rabbits, Dr. Evans said at the age of 5 that she wanted to become a veterinarian. After moving to Northern Nevada, she was known to “adopt” local neighborhood cats, caring for them and feeding them until their rightful owner came calling. Dr. Evans did her undergraduate work at UCLA and majored in biology. It was in Los Angeles at her first job in a small animal veterinary hospital where Dr. Evans knew veterinary medicine was her true passion. Learning about dog and cat diseases, reptile and avian husbandry, and the close bond between a pet owner and their veterinarian at L.A. Pet Clinic, she set her sights on UC Davis and a DVM degree. While attending vet school, Dr. Evans also saw a huge need for pet spay/neuter education and helped to found S.A.P.O. - Students Against Pet Overpopulation. The group traveled to dog and cat shows all over Northern California, helping people to choose breeds based on family dynamics and teaching about the tremendous pet overpopulation problem in the U.S. She also supplemented her learning and income by working her way through school as a technician at an emergency and specialty hospital in the Sacramento area. Graduating in 1996, Dr. Evans came straight to Redding to work for Dr. Ken Haynes at Hilltop Veterinary Hospital. During her work with pets here, she began looking for effective alternative treatments to help her patients when western medicine failed to cure. In 2002, Dr. Evans finished her coursework and internship with the International Veterinary Acupuncture Society and incorporated Chinese medicine into her treatment plans. She has followed this training with numerous courses in Chinese herbology with the Chi Institute and Food Therapy with IVAS. By combining the effective diagnostics and treatments of western medicine with the acupuncture, herbs, and lifestyle changes of Chinese medicine, Dr. Evans has been able to help pets live longer and happier lives. In the past 10 years, family has become an important part of Dr. Evans’ life. Married to her husband, Will, in 1999, the couple have two young daughters, Madeline and Charlotte. While still working for Dana Park Veterinary Hospital, she has continued to help further animals and the role of veterinarians in this community by serving as the president of both the NCVMA and Haven Humane Society. Her love of dogs and helping others brought her to Prescription Pets of Redding, an organization that trains people and their pet partners in animal assisted therapy. 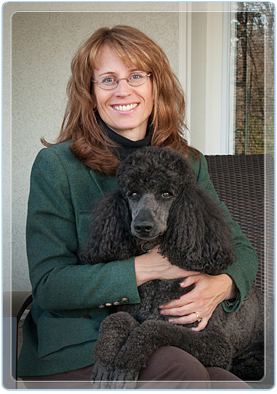 With others in this group, Dr. Evans and her standard poodle, Porter, have brought joy to patients and children by visiting nursing homes, hospitals, and schools. Animals are still one of Dr. Evans favorite hobbies. So to add to the mengerie of horses, chickens, dogs and cats at her home, Dr. Evans purchased two Alpine dairy goats in 2009. With an interest in supplying wholesome, raw milk to her family, she became involved with the local dairy goat society and eventually with dairy goat showing. If not working, Dr. Evans can occasionally be found out on a trail ride on a sunny weekend or enjoying some much needed time with her husband and children.